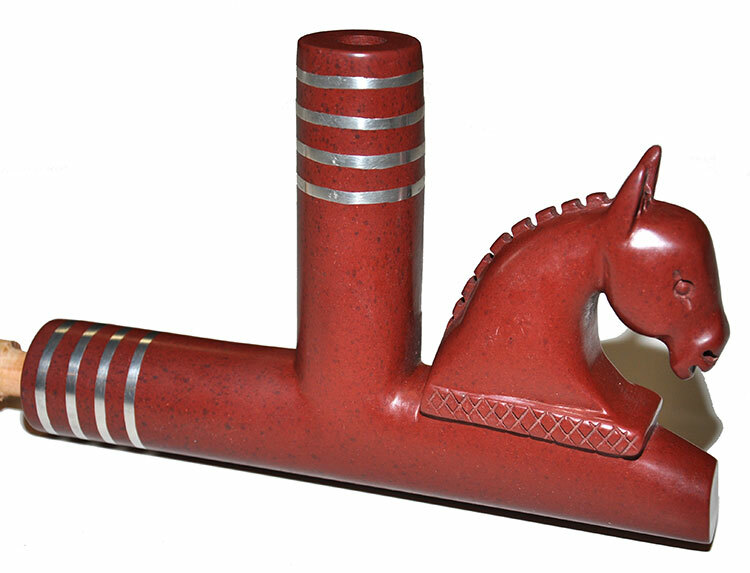 We offer a fine selection of Plains style pipes that are suitable for collections or for ceremonial purposes. You won't find any "interpretive" pipes here made of antler and other non-traditional material. 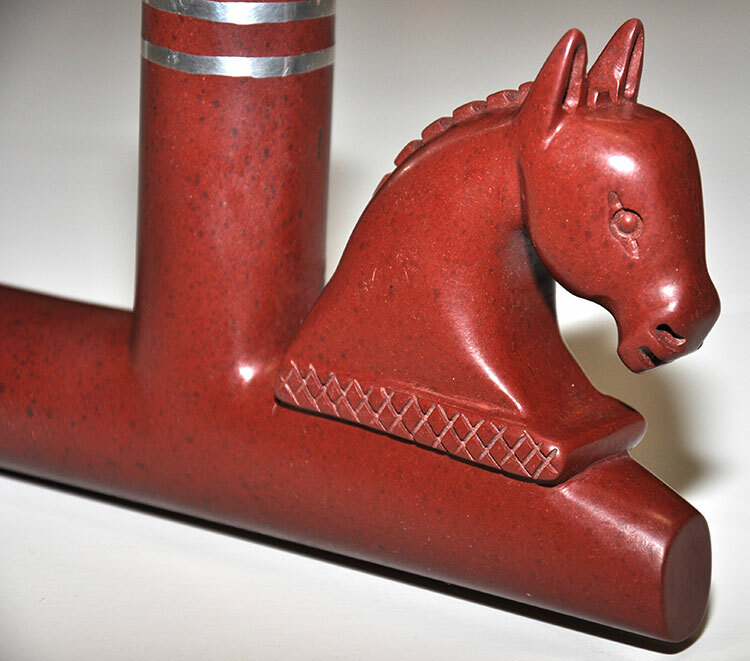 These are the real thing made by master pipe carvers. We ask that if you choose to purchase one of our pipes that you treat it with care and respect. All Native American tribal groups that use the pipe consider it to be a highly sacred object. If you plan to use it for ceremonial purposes, you should seek the guidance of a knowledgeable person if you do not know the right way to handle a pipe. It is said that when you pray with the pipe, whatever you ask for will come true. 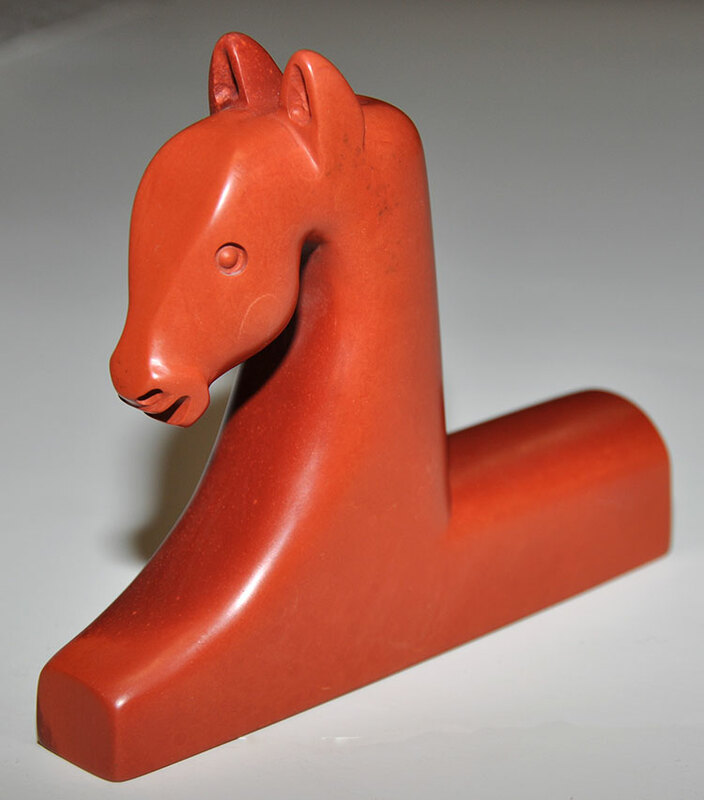 Exquisite Catlinite red stone effigy pipe bowl done in a clasic old-time horse design. This is one of the nicest horse effigies we have had. The bowl is an integral part of the horse's neck. The bowls is 5½ inches long and 4½ inches tall. This is the bowl only, no stem is included. The bowl is made by Lakota artist, Alan Monroe, of South Dakota. Alan quarries all his pipestone from his pit at the Pipestone National Monument in Minnesota. Shipping will be less than quoted by our shopping cart and will be adjusted when we ship the item to you. 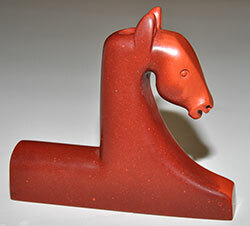 Beautiful Catlinite red stone effigy pipe bowl done in an old-time horse design. The horse is very detailed with pointed ears and ridged mane. There are four metal inlay rings on both the stem and tobacco ends of the bowl that represent the four directions. This is a large bowl, measuring 7½ inches long and 4¾ inches tall. This is the bowl only, no stem is included. The bowl is made by Lakota artist, Alan Monroe, of South Dakota. Alan quarries all his pipestone from his pit at the Pipestone National Monument in Minnesota. Finely crafted catlinite pipe bowl by Lakota carver, Alan Monroe. These are very well made and are suitable for collecting and for ceremonial use. The large bowls average about six inches in length. Exact shape may vary from the bowl illustrated as each bowl is hand carved and the design is determined based on the shape of the stone. If you need a stem, we have pipe stems available. Finely crafted catlinite pipe bowl by Lakota carver, Alan Monroe. These are very well made and are suitable for collecting and for ceremonial use. The medium bowls average about five inches in length. Exact shape may vary from the bowl illustrated as each bowl is hand carved and the design is determined based on the shape of the stone. Finely crafted catlinite pipe bowl by Lakota carver, Alan Monroe. These are very well made and are suitable for collecting and for ceremonial use. The small bowls average about four inches in length. Exact shape may vary from the bowl illustrated as each bowl is hand carved and the design is determined based on the shape of the stone.